This folder contains a collection of photographs from numerous Freightliner galleries. 1.Photos taken at The Freightliner of Canada Production Plant in Burnaby, Canada from back in the mid 80's just a year or two before the plant was shut down. I spent one of my days off at the plant, where I worked in cab final, to photograph each department and as many station and people I could. I am so glad I did this because a few years ago I found all the slides I had taken and had the transferred to digital images and put together a great hardcover book "The Building of a Freightliner". The book is available to purchase thru the link below and all the photos from the book are available in the gallery if you wish to purchase a single photo. 2.Also here is a gallery of photos taken at the 25th. Anniversary Reunion at the Jimmy Mac Pub in Surrey, B.C. Canada on June 3/2017. Included in the photo collection are photos of everyone who attended getting their commemorative coin as well as some group photos. 3.In this 3rd. gallery are a collection of photos I took at the 2012 Freightliner Reunion. I did some candid shots as well as a group shot that I did some custom work to. Use the same password to access the gallery "freightliner". 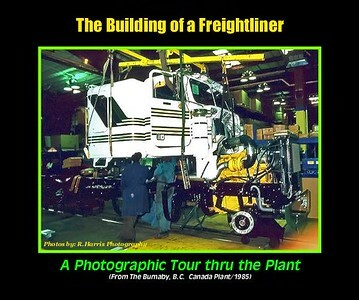 My book "THE BUILDING OF A FREIGHTLINER" is a photographic tour though the production plant that was out in Burnaby, B.C. Canada way back in the mid 1980's. I worked there for 5 years in the cab final department. A few years back I ran across all the old photos I took on one of my days off. I tried to cover the plant as best I could and thought it would be cool to put together a book showing the process. The book is available for sale by clicking on the link here. by clicking on the link you can view the book page by page. You can order it on line and have it shipped right to your home. If you would like to purchase any of the photos in the book just go up and click on the gallery containing all the photos in the book. You can order prints, canvas prints, coffee mugs, puzzles, mouse pads, and much more by clicking on the BUY button at the bottom of each photos.